Fire on the Mountain: FBI! Memphis SWAT unit! All for 20 people at a meeting!! FBI! Memphis SWAT unit! All for 20 people at a meeting!! Yesterday, January 25, was a national day of action to protest the ongoing FBI/Grand Jury witch-hunt against anti-war and solidarity activists in the Midwest. We in Memphis, like people in nearly 50 cities around the country, felt it important to do our part. We had no idea we ourselves would wind up in the middle of what appears to have been a surreal exercise in state overkill directed at free speech and political activism. We had planned an indoor event at the offices of the Mid-South Peace and Justice Center (MSPJC, long housed at the First Congregational Church) from 4 until 6 PM. The featured activity was to be folks present filling out official Freedom of Information Act forms requesting copies of any FBI reports on them. Things started getting strange around 2:30. Three men in suits identifying themselves as FBI agents dropped by the MSPJC offices. MSPJC's organizing coordinator posted to Facebook: "Just had a visit from the FBI.......they claimed that they wanted to alert me that some Anti War activist were planning something around my building....I paused and tried not to laugh..when i said..."Uh..yes sir..these are the offices of the Mid-South PEACE and Justice Center." They promptly left...."
At 3:00, organizers, notified of the FBI drop-in, showed up an hour early for set up. 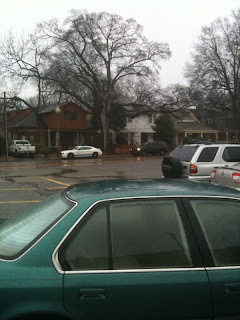 It was kind of hard to miss the marked Memphis Police Department cruisers patrolling the area, to say nothing of the six identical Black SUVs with heavily tinted windows parked in a perimeter around the church. At 5:00 a dozen or so of us armed with phone cameras and two flip cams headed out to face down th' popo. We were joined by veteran Memphis newsman Marc Parrasquia, who knows a little something about police spying--his stories for the Memphis Commercial Appeal last year exposed Earnest Withers, a beloved Civil Rights Movement photographer, as an FBI snitch. We demanded that his supervisor come down. The tactical team supervisor scurried down to the scene, claiming to be unaware of the FBI visit and said "a concerned citizen" had made some sort of call to the Union Avenue station and they had been dispatched to "protect" the action. MSPJC staff made calls to the mayor's office, and ultimately spoke at length to the assistant police chief, who admitted having given the order to dispatch the small-arms carrying unit. He also claimed to know nothing about the FBI visit and gave the same story about the call into the precinct. While all this was unfolding we learned that Shelby County sheriffs had pushed into least two homes of progressive Memphis area activists earlier that day, citing (but not showing) warrants for individuals. In one case not only had the individual not lived there in years, the cops felt it necessary to go room to room with guns drawn for a “failure to appear” charge in traffic court. One very good result was broad media coverage. Right from the start of the madness, we began re-calling press outlets which had responded to our earlier generic notifications and followup calls about the event along the lines of "Ho-hum. Well, maybe, but don't you know there's a snow emergency on?" The magic letters FBI turned out not only the Commercial Appeal but also the local ABC and Fox affiliates, all of which ran stories on the confrontation. And more media calls are coming in today. At the moment, we are demanding further information about the nature of the mystery phone call (which raises the interesting question of what exactly does one say in a phone call to a precinct cop that turns out the Tact Unit normally reserved for scenes out of a Die Hard movie) and contacts between the FBI, the MPD and the Shelby County Sheriffs Office. We are also collecting further information on the raids and other actions law enforcement made or may have made at other Memphis area activists and exploring our legal options. We are also beginning deeper investigation of the daily actions of the Tact Team and local law enforcement generally. When they aren’t staked outside a church to provide surveillance on a group of mostly white anti-war activists, which communities in our city are they harassing? Are these psycho-drama style tactics their usual MO? In the end, the issue isn’t if these cops could have been better used elsewhere in the city during a rare snowfall, but if the resources that get spent equipping these paramilitary thugs could be better used by our communities. Until and unless we learn something different, the progressive community in Memphis is taking this as one more example of the ramped-up repression of free speech and assembly in this country. And a challenge to unite in earnest with struggles in our city against wide-spread police brutality and daily police oppression. We are determined not to be intimidated. Would you be willing to let OpEdNews.com re-publish this? OpEdNews would link back to this blog by saying, "This article was originally posted..." And, we would of course credit you. I am currently publishing a series of articles called "Profiles of the Targeted." I have published two in the series and have more to come. This is great and necessary work, T. Sheldon. Kevin, yes. Go for it. Folks on the receiving end of the FBI / MPD visit are totally overreacting. So the FBI came & "promptly left." Big deal. 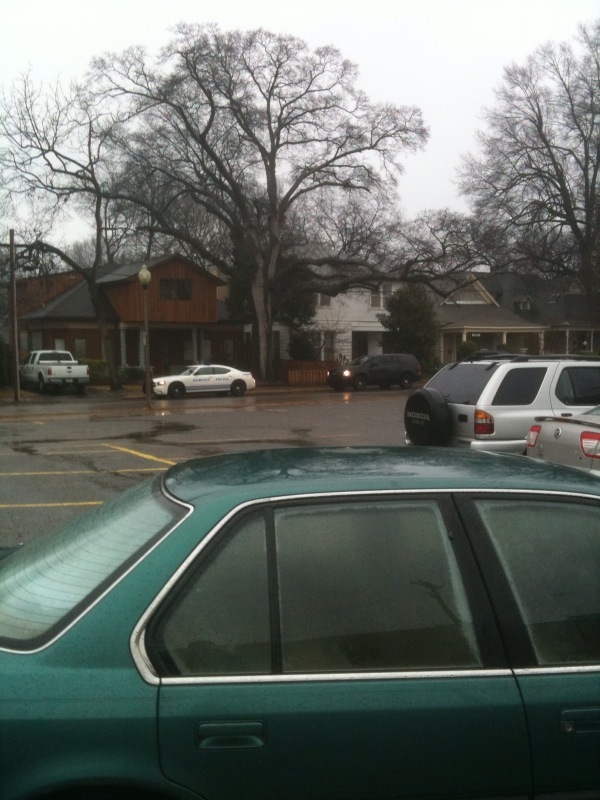 The MPD were outside the building; a building inside which an event was taking place. Did they interfere with people's access to the property? Did they make any threats? Did they make any specific demands? What *exactly* did they do that constitutes harassment? The MPD were expecting a large outdoor demonstration. MPD reacted appropriately given the information available to them @ the time. David, you are a nutter. Have you being paying attention to what is going on all over the US for the last few months? Meetings much like this one have been targeted by law enforcement and the participants have been harassed, imprisoned and surveillance equipment (i.e. bugs and gps) have been found on their cars and in their homes. Re-posted. Your blog should get a boost in traffic today (hopefully). Question: I notice one of your "key links" is to the Freedom Socialist organization. Do you think what happened at the peace center is connected at all to current criminalization of Freedom Socialist activities? Some of the activists raided and subpoenaed have subpoenas mentioning the FBI is interested in their involvement with Freedom Socialists. An example of why you should never allow an officer in your house unless they present you with a PHYSICAL COPY OF A SEARCH WARRANT. That's Freedom *Road* Socialist Organization. The Freedom Socialist Party is a different organization which mostly exists in the Pacific Northwest. Apologize. Freedom Road... That's what I meant. My question remains. @ Kevin -- There are two FRSOs. The link above is NOT to the FRSO involved in the previous FBI raids. This is so outrageous! This state is going so far into police-state land that it's scary. Then you have reps like Tony Shipley wanting to allow police to break into your house because of "reasonable" suspicion rather than probable. Now, Casada is trying to make it illegal for unions (workers) to donate to campaigns while corporations can make unlimited donations! They want us all scared, disheartened, and miserable. Just good, cowed, corporate employees. This blog was linked to me and I found it pretty compelling. I have a hard time taking it as fact though since there wasn't and links to prove it actually happened, (news article, viedo etc.). I'm not outright dening this happend I was just hoping to maybe have some links that validate it. There are other, ABC24 ran a story, CA is doing follow-ups, etc.